The U.N. Has Stopped Counting, But Syrians Keep Dying : Parallels The Syrian death toll has passed 100,000 but it's become too difficult to accurately keep track of all the killings, according to the United Nations. 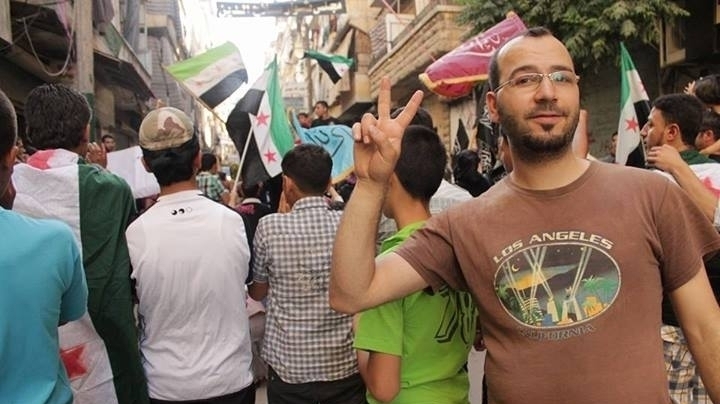 Here's the story of one recent death: a nurse who had helped establish a makeshift clinic in one of Syria's most contested cities. Kotaiba Mohammad poses during an anti-goverment demonstration in the northern Syrian city of Aleppo. He worked as a nurse, helping those wounded in the country's civil war. He was seized and shot dead last month by Islamic extremists. The United Nations announced this week it is no longer updating the Syrian death toll, which has surpassed 100,000, because it cannot accurately confirm the number of dead due to chaotic conditions in the country. But Syrians are still being slaughtered, and the fighting has gotten more complicated than ever. It's not just President Bashar Assad's government army versus the rebels. The rebels are also battling rebels, and civilians are often the casualties, including a male nurse from Aleppo. Kotaiba Mohammad, who was in his mid-20s, was wearing glasses and a white medical robe and sitting behind his desk at a medical clinic when I met him last July. He immediately struck me as a calm person who was willing to help anyone in need. And that's just what he did for me. He offered to accompany me to an extremely dangerous checkpoint that separated the government-controlled part of Aleppo from the rebel-held side of the city. The fighting has largely been a stalemate in Syria's largest city for well over a year. Kotaiba Mohammad worked as a nurse at a medical clinic in Aleppo, helping those wounded in Syria's civil war. While we were trying to interview people crossing the checkpoint, a Syrian army sniper started shooting, and then blasts from machine guns followed. "What a pity! Many people will get injured now. I should head back to the medical clinic," said Mohammad. But when the shooting eased, he changed his mind and said we should go forward and see if there were any wounded. We didn't find any casualties, and eventually made it back to the clinic. Mohammad joined the anti-government demonstrations shortly after the uprising began in the spring of 2011 and as the violence increased, he put his medical training to use. 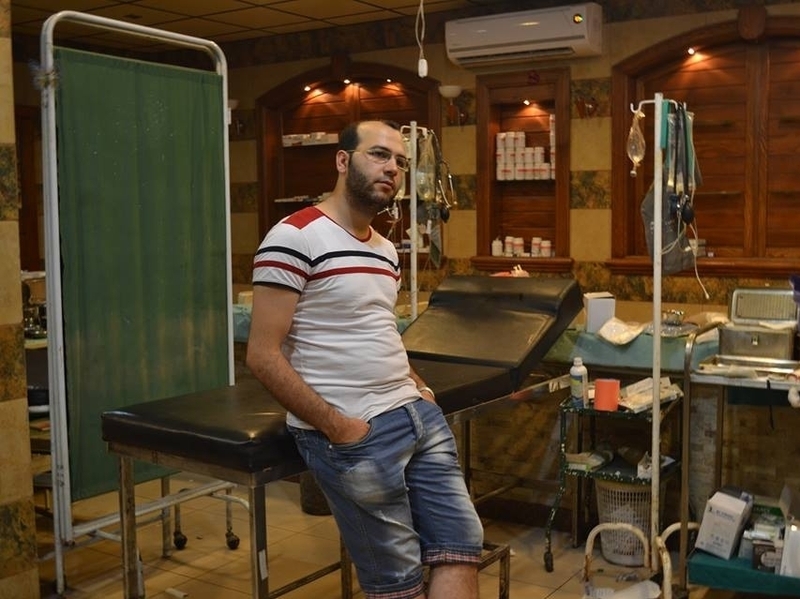 Later, when his neighborhood came under rebel control, he and other young men, including two of his brothers, converted an Arabic sweets shop into a medical clinic. Most doctors had fled the neighborhood due to the fighting, but Mohammad and his colleagues remained to help the growing ranks of the wounded. Mohammad and his brothers learned their medical skills from their father, a medical worker himself. They worked in shifts and performed multiple duties. They would collect those wounded by government shelling and would bring them into the clinic for treatment. Mohammad and the others would sleep when they could, retiring to mattresses in the attic of the clinic. Last August, Mohammad's youngest brother was killed when a missile slammed into their neighborhood. The same missile killed a friend Mohammad had been training to become a nurse. Another colleague disappeared after taking an ambulance to a neighborhood that had been shelled. Eyewitnesses said he was last seen stopped at an ISIS checkpoint. But Mohammad continued with his work until Dec. 26, when he happened to be at offices of an anti-government TV channel at the wrong time. Gunmen from the Islamic State of Iraq and Syria, or ISIS, an extremist movement linked to al-Qaida, stormed the center and seized eight people, including Mohammad, according to his colleagues. ISIS is battling both the Syrian government and other more moderate rebel groups. Amnesty International, in a press release last month, said the group was responsible for many abuses, including summary killings, across northern Syria. And that's precisely what happened to Mohammad. His older brother, Abdallah, was shot, but managed to escape. However, five of the eight who were captured, including Mohammad, were all killed execution-style, according to Mohammad's friends. It was just one more deadly episode in the ongoing carnage in Syria.